There was a time when matching everything was the name of the game in home decor (and personal dress), but that time is decades behind us. We are now looking to the future with grown up colors and patterns. Don’t worry, your furniture does not have to be over-the-top to spice up your space. Any neutral couch can be livened up with fun accents, or if it suits you better your space or furniture set can be refined with the right elegant fabric for your pillows and bedding. Austin Blind Faith will give you the assistance you need or work with your interior designer’s specifications to find just the right fabric to complement your window décor. No matter what you decide to do in the end, it all starts with the window treatments themselves. There are so many to choose from and much to consider when it comes to what you dress your windows with. Shutters are excellent for a customized, time-honored look and can be some of the most versatile window treatments to decorate around. Draperies can add a flair of the dramatic and are a lot of fun to coordinate or use as a focal point for a room. Draperies are a lot of fun to play with when it comes to adding accents. A lesser known service that Austin Blind Faith offers our customers around the Austin are is our fabric selection for accent items like pillows and window seats. Once you have selected which style of window treatments you want and opted for a color scheme, it is time to decide on your accent colors and patterns. You can choose patterns that are different but play well off one another or you can match your solid color draperies to a patterned fabric for pillows and bedding, and vice versa. The fabric selection at Austin Blind Faith is extensive with tens of thousands of options for both indoor and outdoor use. We use the best quality fabrics for your specific project needs. Kasmir Fabrics – From their 200,000-square-foot state-of-the-art facility in Dallas, Texas, they offer one of the industry’s most extensive inventories of fabric and trims. Wesco Fabrics – Wesco Fabrics is a second generation family owned wholesale home furnishings business that features thousands of beautiful, decorative fabrics for window coverings, furniture and bedspreads. Duralee Fabrics – Duralee continually creates palettes and styles with comfort and authenticity, injecting a heavy dose of what’s now and what’s timely, all the while maintaining a balance with timeless versatility. Schumacher – An extensive selection of exquisite fabrics enables a designer to create luxurious and comfortable spaces. In other areas of the home, Austin Blind Faith can help with accent pieces like accent pillows and window seat coverings. When it comes to the bedroom, there is much more opportunity to play with different fabrics and textures. Create a completely customized bedroom retreat with luxurious fabrics or modern, minimalist designs. 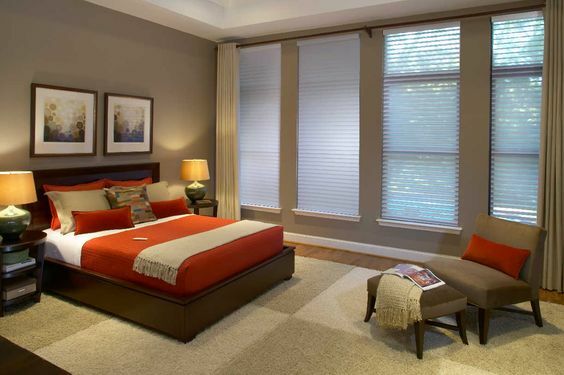 At Austin Blind Faith, we love what we do and are excited to be able to not only serve our clients by helping them design and install their ideal window treatments but to create a customized feel for their entire room with our accent and bedding options. If you are looking to create a unique, quality design for your home or your client’s home, contact Austin Blind Faith today and discover the service that makes all of our clients so happy!